Original New Australian Musical to Open the 2017 New York Musical Festival! It was announced in New York this week that ERROL AND FIDEL, a new musical written by four Sydneysiders, will open this year’s New York Musical Festival, the most prestigious showcase for new work in the music theatre world. The musical was selected for the Festival (NYMF) from hundreds of submissions from around the world, and is the only overseas production to make the cut. It will be performed on the prestigious July 10 opening night on 42nd Street, and will be performed another five times during the Festival. ERROL AND FIDEL was written by Boyd Anderson and Guy Anderson, with music by Peter Kaldor and John Kaldor, and lyrics by Boyd Anderson. It is the team’s first attempt at a musical, and is based on Boyd Anderson’s 2010 novel, Errol, Fidel and the Cuban Rebel Girls. It includes 21 original songs in a mix of styles, from Cuban mambo to MGM showtune to Doo-Wop. It tells the story of the bizarre (but true) relationship between iconic 1930s movie star, Errol Flynn, and Cuba’s rebel leader, Fidel Castro, at the height of that country’s revolution. Born in Hobart, Flynn was one of Hollywood’s biggest stars during its Golden Age, infamous for his outrageous personal life, and also one of the most internationally famous Australians who ever lived. Author Boyd Anderson with Michael Bello who will direct ERROL AND FIDEL for the opening of the New York Musical Festival on July 10. Photo courtesy Facebook. Set in Cuba in 1958; Revolution is in the air! In his final year of life Errol Flynn has one last adventure. The dashing star of so many Hollywood blockbusters yearns to be a real hero, and Fidel Castro fits the bill. 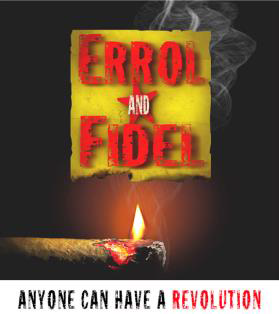 What Fidel craves is fame, and who better than Errol to show him how? At the height of the revolution an explosive encounter beckons – fuelled by envy, lust, and vanity – with a mysterious woman calling the tune. Or could the CIA really be pulling the strings? Who knew revolution could be so much fun? The musical captures a restless Flynn in the fading twilight of his film career as he chases a lost dream to be a genuine, real-life hero. Being Flynn, it all starts with a woman. He follows the mysterious Lola, who lures him into the wild Cuban mountains to meet rebel leader, el Gigante. As revolution rages around them, the stage is set for an explosive encounter. Now in its fourteenth year, the New York Musical Festival is the premier musical theatre event in the world. It nurtures the creation, production, and public presentation of stylistically, thematically, and culturally diverse new musicals to ensure the future vitality of musical theatre. Launching new musicals and discovering new talent, the Festival provides an affordable platform for artists to mount professional productions that reach their peers, industry leaders, and musical theatre fans. More than 90 Festival shows have gone on to productions on and Off-Broadway, in regional theatres in all 50 states, and in more than 24 countries worldwide.